We see Gauguin trying to overcome the extreme naturalism of the impressionists. He felt that with them the artist had become a slave of nature. Gauguin struggled to find new ways of representing reality in order to include more than the eye can see, in order not to imitate or copy but to create in a truly human way. In 1889 he painted one of the first great works that expressed his aims, the ‘Vision after the Sermon’. Women from Brittany, with their simple yet deep faith, have heard a sermon on the fight between Jacob and the Angel: they see it in all its reality before their eyes. 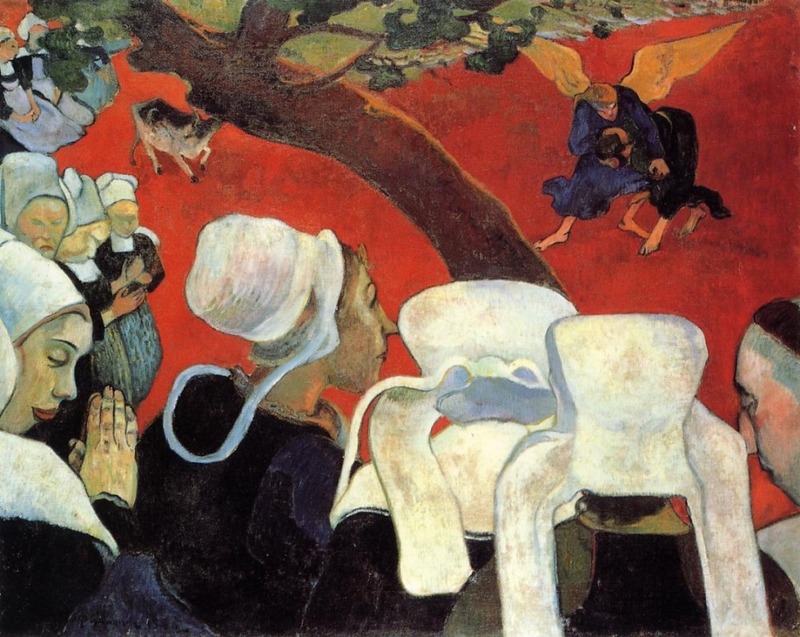 Yet they are not so stupid as to think that it is a real man fighting the angel there before them—they are human!—so Gauguin paints the grass red. Yet, to these women, the story of Jacob is as real as their cows; the story took place on the same level of reality as the one on which they themselves lived—so, on the same red grass we see a real cow, with the very decorative effect of the women’s hoods forming a linear pattern, and then the flat colours—the red, the brown of the tree, the white of the hoods. In this way Gauguin tried to give his work a more human touch, expressing feelings and knowledge and human reactions to the realities of life, while at the same time he gained a new freedom for the artist to use colours and design in a free way, overcoming the narrowness of merely copying what the eye registers. In an explicit and definite way he wanted to overcome the positivist [scientific] approach to reality, with (as Gauguin said himself) its loss of all feeling ‘for the mystery and the enigma of the great world in which we live’.